The Campaign for Real Ales (CAMRA) is sponsoring a forum in which to ask your MP (representative) to reject legislation from the pub industry (many closely tied to the brewers themselves) that would define a pint as no less that 95% of a pint (or 16 oz). The page also includes a full pints calculator to determine how much money you’ve been cheated out of depending upon your average pints of ale or lager consumed per week. I love CAMRA and their reactionary fight to protect the sanctity of ales in the UK. But I don’t think their membership would fare as well here since so much of our beer consumption is in bottled form. I’m hoping that’s something we’ll be able to change in our own lives, even if those real ales are just my own. I’ve missed most of the PDX Barleywine Long Haul, but did manage to catch up on some of the samples last night at the Blue Monk. What amazed me the most was the quality of the samples – they were approaching beer perfection. I was especially happy with Lucky Lab’s Old Yeller 2003. If you can – try this beer. Its on tap at Blue Monk and probably at the brewery. I moved my Bitter from primary to secondary (P.G. 1.014) and reused the yeast cake on a flaked barley stout. The stout used a mass of grain that might have been a bit excessive, but the wort tasted pretty good and the O.G. was 1.054. 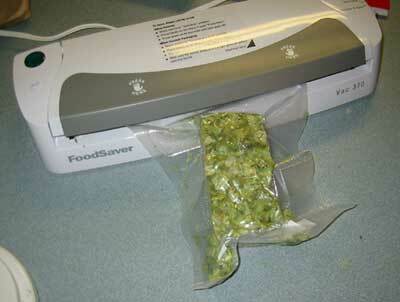 I bought a vacuum sealer yesterday so I could cut and bag my fresh hops without sacrificing their freshness to the freezer. 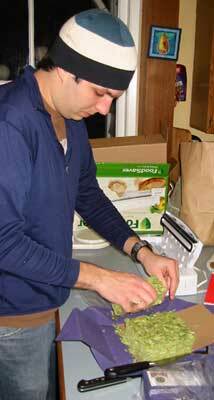 The sealer I bought worked like a charm, and did an awesome job of compressing the hop packages. 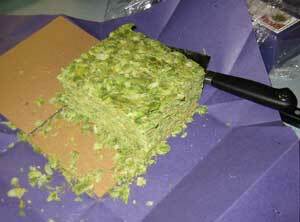 The most impressive part was how quickly I was able to slice up the 5 packages of hops and seal them in brewing quantities for later. I smelled quite a few varieties last night, and Crystal was by far my favorite of the bunch. The aroma was stellar – citrus and pitch. I can’t wait to brew something special with them. Today I brewed with an ounce of Galena for bittering and 2.2 oz of Fresh UK East Kent Goldings. I brewed a fairly traditional special bitter and used munich and British pale malt for flavor. The brew supply store didn’t have any Maris Otter. I’ve added two new(er) recipes. Both should highlight the UK East Kent Golding’s that I got from my father-in-law for Christmas. One is Andy’s Special Bitter (ASB), the other Flaked Barley Stout. For cost savings, I’m going to reuse the yeast cake. Naturally, I’ll be brewing the bitter first. Otherwise I might color and/or flavor pollute the bitter. I’ve made a few minor changes to the site, and will be making more over the next couple weeks. Most will be invisible as they are mostly changes to the underlying code. Others, like the News Archive section on the right now include links to categories and all listings instead of by-month archives. I’ve also added a creative commons license to the site, which now replaces the copyright at the bottom and allows you to use anything on the site like the recipes (thanks to Vores Ol for the idea) but not for your personal financial gain. Not that my recipes scale to brewery size, but more as a way of sharing with the community. I added a second IBU calculator that uses Glenn Tinseth’s formula. One of the advantages of his method is that it is supposedly superior for full-wort boils. With a 10 gallon kettle, I’ve been doing full wort boils for some time, but my IBU numbers have been a little wacky, a little excessive. This should help things out. 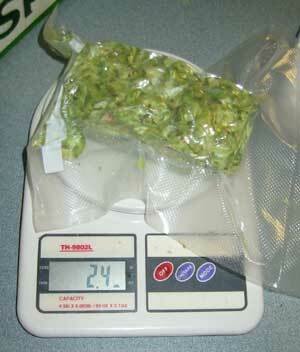 The one thing I’m uncertain about is the utilization difference between whole hops and pellets. I accounted for the difference the Rager calculator. I’ve written Glenn Tinseth himself and hope he’s willing to shed some light. He knows much more about hops that I ever will.